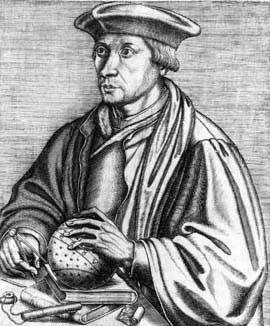 Oronce Finé (in Latin, Orontius Finnaeus or Finaeus) (December 20, 1494-August 8, 1555), French mathematician and cartographer. Born in Briançon, the son and grandson of physicians, he was educated in Paris (Collège de Navarre), and obtained a degree in medicine in 1522. He was imprisoned in 1518 during his time as a student; in 1524 he was imprisoned once again. In 1531, he was appointed to the chair of mathematics at the Collège Royal (the present Collège de France), founded by Francis I of France, where he taught until his death. As a fortifications expert (in keeping with his training in mathematics), Finé worked on the fortifications of Milan. He gave the value of pi to be (22 2/9)/7 in 1544. Later, he gave 47/15 and, in De rebus mathematicis (1556), he gave 3 11/78. Finé wrote on astronomical instruments and astronomy. On how to determine the longitude of places, he suggested that eclipses of the moon could be used to determine it, and described an instrument he called a méthéoroscope, an astrolabe modified by adding a compass. In 1542 appeared his De mundi sphaera (On the Heavenly Spheres), a popular astronomy textbook whose woodcut illustrations Finé also produced. He also invented a heart-shaped map projection, frequently utilized by other cartographers, such as Peter Apian and Gerardus Mercator. Finé attempted to reconcile discoveries in the New World with old medieval legends and information (derived from Ptolemy) regarding the Orient. Thus, on one of his two world maps, the legend marked Asia covers both North America and Asia, which were represented as one landmass. He used the toponym America for South America, and thus Marco Polo's Mangi, Tangut, and Catay appear on the shores of the present-day Gulf of Mexico. On the same map, Finé drew Terra Australis to the south, including the legend "recently discovered but not yet completely explored," by which Finé meant the discovery of Tierra del Fuego by Ferdinand Magellan. He also published a woodcut map of France (1525), one of the first of its kind, and also constructed an ivory sundial in 1524, which still exists. Jean Clouet painted a portrait of Finé in 1530, when Finé was thirty-six years old, but the portrait is now known only by a print. The lunar crater Orontius is named after him, using his latinized name.